TIP 1: Add 1 drop to your protein shake, water (hot or cold), coffee or cocoa for flavor and for a pick-me-up without the side effects of caffeine! 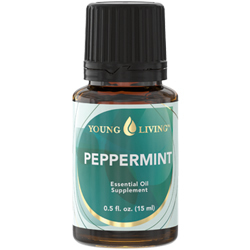 Remember with peppermint, a single drop goes a LONG way! TIP 2: Apply 1 to 2 drops to the base of your neck or temples to help ease your headaches. Keep away from your eyes, the fumes are strong and can cause your eyes to water. If you do get it into your eyes, rinse with Young Living's V6 oil or olive oil...never water! TIP 3: Put a drop or two into your hands and massage into sore muscles after a workout...or a sprain or strain! TIP 4: Diffuse into the air to help wake you up when you are sleepy. If you are sleepy when driving, put a drop or two onto a kleenex, napkin or coffee filter, tape over your heater vents and let it diffuse into the car to help keep you alert! TIP 5: If you are hot or overheated, put a drop on the back of your neck and it will help cool you off! BONUS TIP: if you have a dry, tickly (yep, I think I made up that word) cough, rub a drop or two on your chest to settle it! PROPERTIES of Peppermint include: cooling, anti-viral, neurotonic, decongestant, penetrating, simulating to the heart, brain, liver, and pancreas.